For those of you trying to change your ways as far as your water consumption goes, you know it’s not always an easy task. It’s especially not easy when you have a full family you’re trying to make more aware of their water usage. There are various gadgets out there to help with that sort of thing. A lot of which are more worried about how long you’ve been in the shower and on occasion they shut off the water for you. Well this gadget goes for a subtle approach and tries to gently persuade you to cut down on the amount of water you use. The gadget has several bright blue LED lights. Every single time you use 5 litres of water, one of the pretty blue lights will kick on. It lets you know just how much water you’re tossing down the drain. 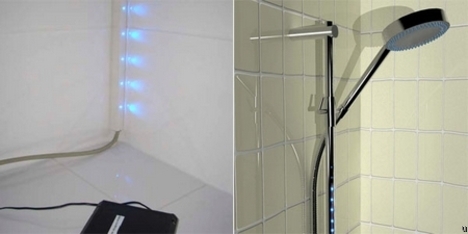 The design was built for a scientific paper researching the effect of ambient displays on water usage within the shower. It turned out that it was actually pretty successful, people used about 10 litres less on average. They did discover that they only reduced the amount of water they used while this was in the shower. Once it was removed they went back to their same old habits. If this ever did become an actual product, it might be nice to have around.